As you can see, this is a medley heavy album. Utopia's themes are said to be lighthearted that incorporate musical styles from technopop to ethnic. It's being handled by Basiscape, the very same label behind the 25th anniversary arrange albums. The album is due on January 14th for 3,300 Yen. 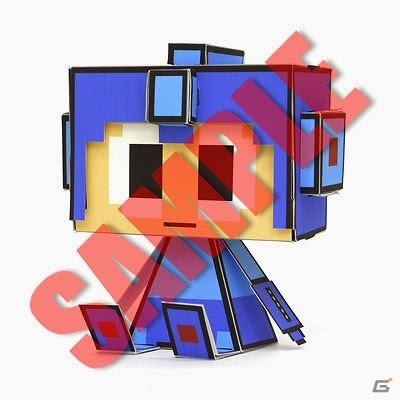 In addition to a booklet contain exclusive new artwork, the first print will also feature a paper craft classic Rockman insert (seen above). Thanks to Heat Man for the heads up! 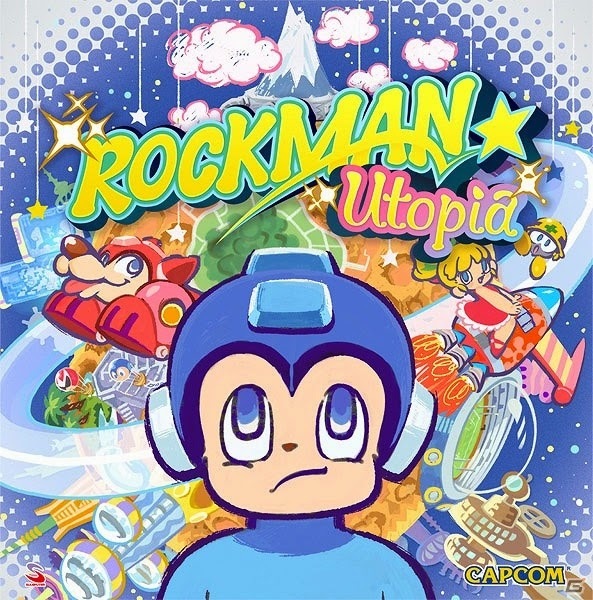 The cover would look neat if not for that super awkward looking Mega Man slapped in the middle of it. At least have him look happy and excited, jeez! Disgustingly bad design choice. The mind boggles. At least this tracklist looks more unique than the usual 50 MM + MM2 remixes. They have stuff from MM6, MM7 and MM8! That stuff rarely ever gets remixed. Yay, some MM7 soundtrack love! I think this list is looking pretty good so far. It's nice to see the non 8-bit games getting some attention for once. Wow, I'm surprised at the representation from Mega Man 7 and 8! I mean, how often does this happen? Hearing what these remixes sound like, and whether they're any good, is another story altogether. I do wish they'd use something from Mega Man & Bass, though. I'd love to hear more remixes from Mega Man & Bass. The music is severely underrated. For all we know, this could be any of the Mega Man games that had a Wily Castle 1 stage. I really don't care for this idea. As much as I like lighthearted gameplay, lighthearted remixes isn't really my thing, especially if it's of a tune that has a minor feel to it. Also, I'm not a big fan of the cover. I mean, I kinda get it. The original series is lighthearted. Jeez. Though to be fair it has its sad moments and music. Cannot wait to see the tracklist to the other CD with X. =) Though I'm on the same boat on that one. X was more dark, yes, but it wasn't DYSTOPIAN levels of dark, in my opinion. It had some tunes that were loveable and huggable. At least, not until 6 came along and made everything really unpleasant. I guess I wish both series covered both dark and light moments in their remixes instead of one or the other. Guess I just can't have everything under the sun. Meh. I tend to agree about the Original series. I'm a big fan of the Ariga works because they do a pretty good job of covering light and dark moments, but I haven't seen many other works that do, at least for the Classic series. That said, some of the Powered Up remixes were kind of nice, so I'll give these a listen. Damn, they left out Mega Man 4. Are there so few like me that like Mega Man 4?